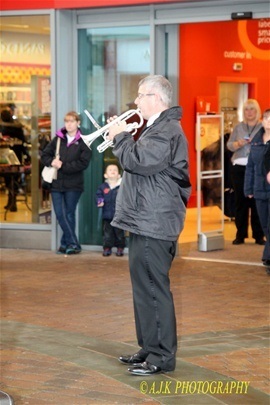 As part of the service, our principal cornet player, Dave Ashby played the Last Post. On Saturday 24th October, Corby Silver Band played at the launch of the Corby Poppy Appeal at Willow Place shopping centre. The band performed a selection of music suitable to the occasion including 'In Flanders Fields', 'Evening Hymn and Sunset', and 'The Royal British Legion March'. On Sunday 13th September, the band performed our final summer concert in our busy diary of performances at the Pleasure Park bandstand in Kettering. 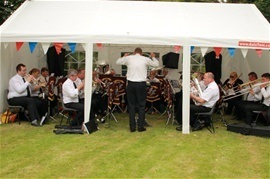 For once the sun was shining and the band played to an appreciative audience who enjoyed our musical repertoire which included a selection of marches, well known songs from films and musicals, all time classics and modern day pop items and performances featuring some of our talented soloists. We are mid way through our summer season of concerts, having performed at the Market Overton open day, Rushton School fete, Abington Park Bandstand, Brigstock fete, and a very special performance to mark the 50th anniversary of the Corby Silver Band Club. 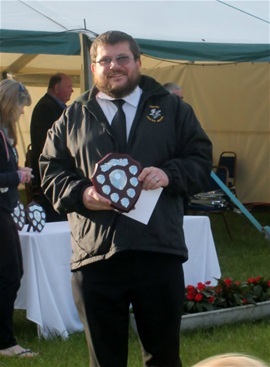 On Saturday 16th May, the members of Corby Silver Band, who choose to contest, were celebrating success after being awarded 2nd place in their section of the Wood Farm Brewery Contest held in Willey, near Rugby. This event is now in its 3rd year, and once again Corby Silver Band were amongst the prize winners in group B, which is open to bands who are graded in the 3rd and 4th section. 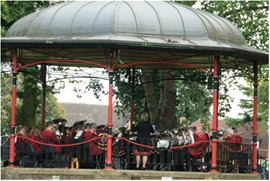 Corby Silver Band were the highest 4th section band, being beaten by a band that plays in the 3rd section. The band received prize money and a shield, which is now on display at the Corby Silver Band Club. If you would like to be part of a prize winning team, then please get in touch!